I know it’s not fair for us to tease you with good games that are difficult to find here in the U.S. But we’re determined to highlight only the best of the best, and when there are over 5,000 new games published every year, it should be no surprise that many of them begin their lives in other countries. Yesterday’s Terrible Monster game is a perfect example. So we’re going to make it up to you today with another Halloween-appropriate game for your consideration. 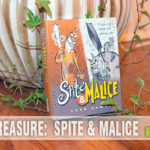 And we’re giving you a chance to win a copy for yourself at the end of this article! 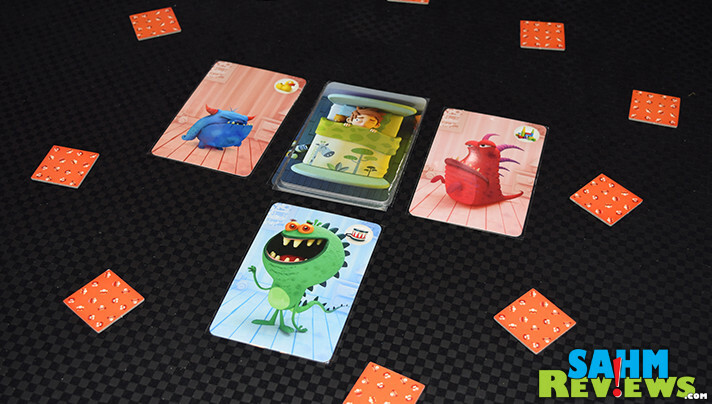 Please don’t rush down to just enter, make sure that Monster Chase by iello is the perfect fit for your family first! So far the games we’ve featured in this Halloween special have been ones that you get to play as (or utilize) monsters to win the game. Monster Chase is a little different in this respect as you might have guessed by the title. You’re not actually chasing monsters, but chasing them away. These are the monsters that hide under your bed. But did you know that they are scared of toys? Not just any toy mind you, but each monster type has a built-in fear of one special toy. The only way to get them away from your bed is to use that exact toy to scare them away! 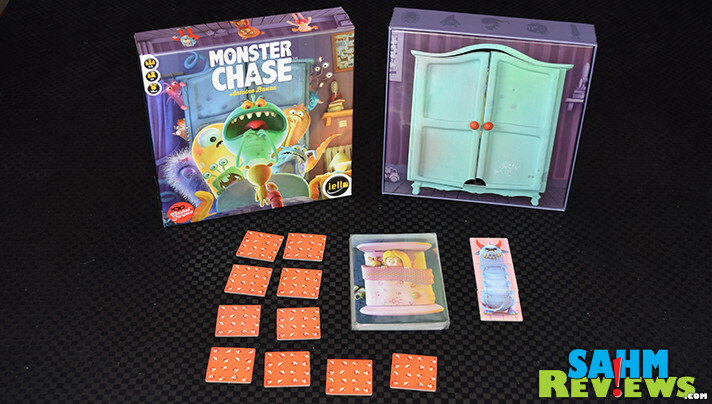 While not obviously advertised that way, Monster Chase is a cooperative game where everyone works together to save the children from the monsters underneath their beds. Included in the uniquely-designed box (more on this in a minute) are twenty Monster Cards with the opposite side depicting the sleeping child. 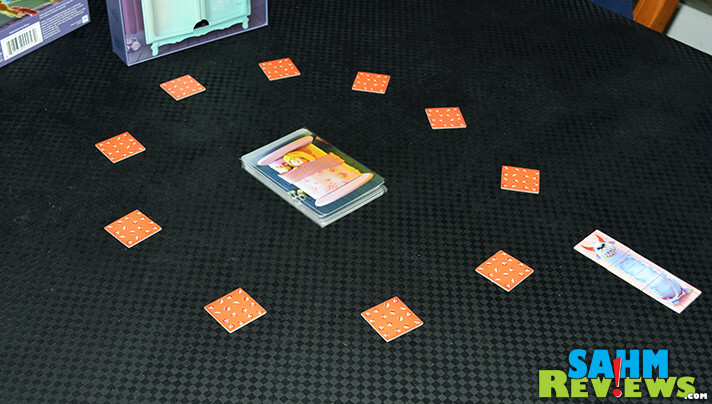 Determine how difficult a game you wish to play and shuffle 10/15/20 cards into a pile and place them in the center of the playing area. Without looking at them, also mix up the ten Toy Tiles and lay them face down around the bed. 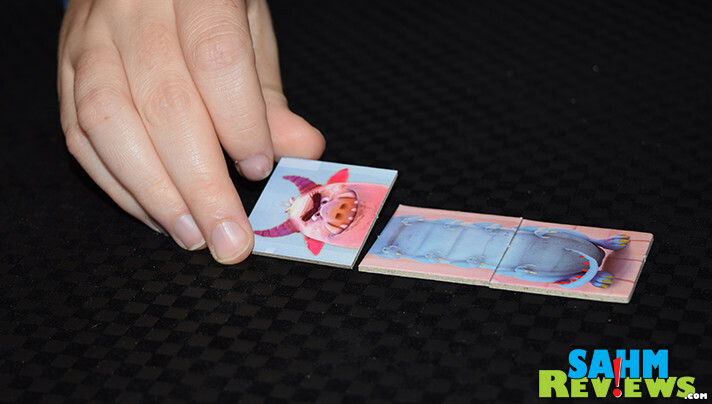 A set of three tiles creating a different monster acts as a game timer and is also laid into the play area. One monster is revealed by turning over the top card from the deck and placing it orthogonally adjacent to the bed. Your game of Monster Chase is under way! 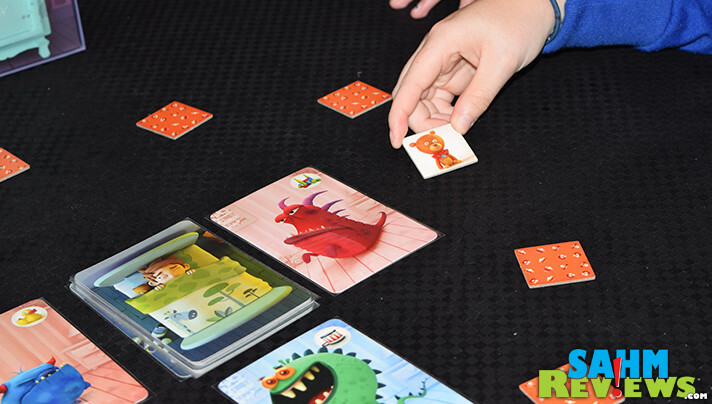 Each player takes turns in clockwise order trying to find the correct toy to scare away the monster currently creeping up on the child. On your turn you will flip over a Toy Tile and compare it to the Monster Card. 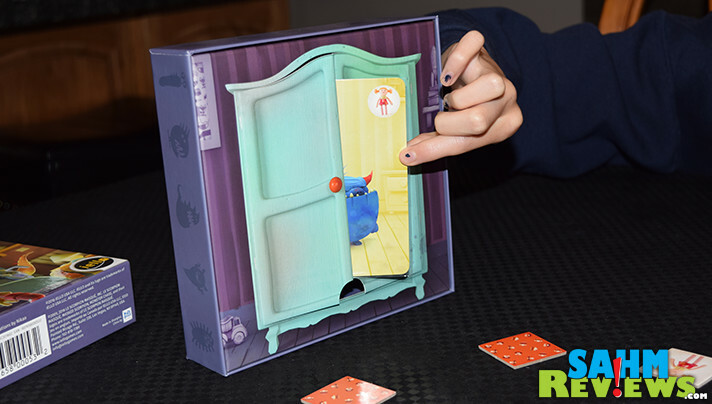 If it matches, the monster is scared away and the card is put into the standing closet, a cool hiding place made by combining the box bottom and a custom insert. Another monster is then turned over in its place. 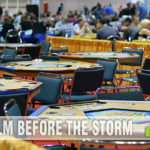 If the tile does not match, flip over one of the three tiles that create the monster and pass your turn to the next player. If all three tiles are already flipped, then another monster reveals himself from under the bed and its card is put into one of the four spots around the bed, if not already occupied. If players succeed in sending every single monster to the closet, the players win! 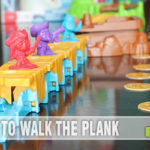 However, if the monsters ever occupy all four spaces around the bed or if you are tasked to reveal a monster after the entire deck is depleted, the monsters win. The only way to get back at them is to play again! Supporting up to six players, don’t let the age recommendation of 4+ prevent you from picking up the game for slightly older monster hunters. Included in the rules are variations to make the game more difficult with bonus tiles (socks and a monster under a blanket) that penalize you if you reveal them more than once. An even harder version requires you to scare away all revealed monsters at the same time instead of one at a time! Of course, combined with additional cards (up to the full compliment of 20), Monster Chase will be difficult enough even for those of use who only check under the bed a couple times a year! Pick up a copy of Monster Chase on Amazon for under the $20 MSRP or search for one at your favorite local game store. 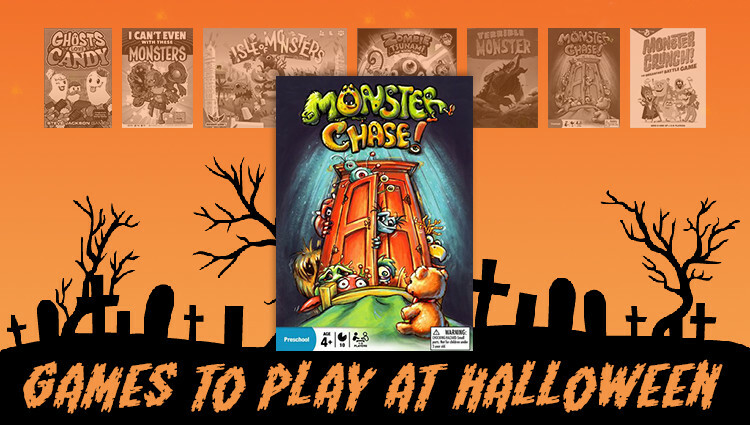 And as previously promised, enter below for a chance at winning a copy of Monster Chase direct from iello! Be sure to come back each day for additional entry opportunities! Just don’t let that monster get you first! I was always worried that there would be spiders or snakes that would get out and crawl on me. I was afraid of going into our basement at night. I was terrified of tornadoes. My father when he was mad. Monsters outside my bedroom window, staring at me at night. I feared spiders under my bed. I would say also being scared of the closet. I was afraid of horses. Cite!! I haven’t heard of this one before!